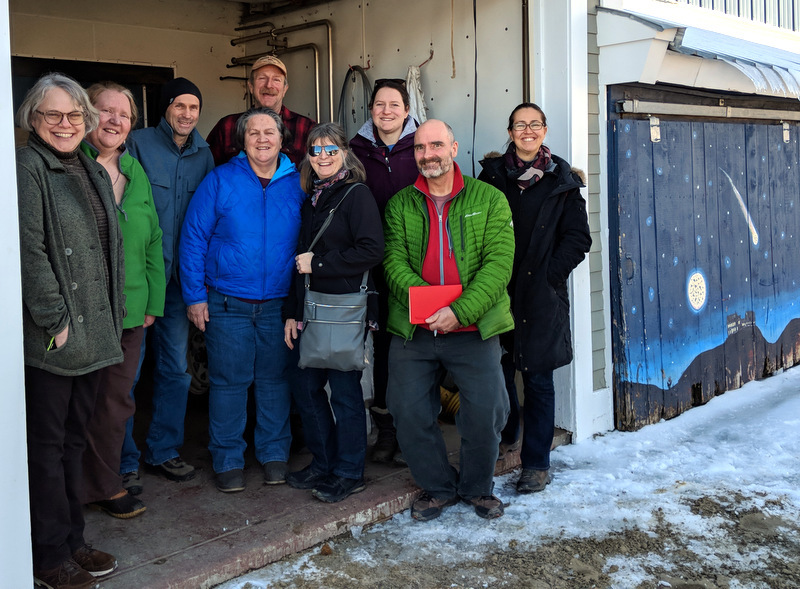 Several members of the Maine Cheese Guild traveled to Vermont the week of February 26th to visit a number of creameries. 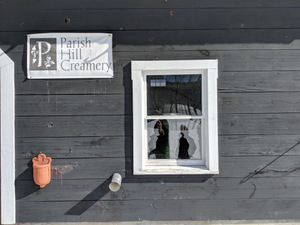 Among them were Parrish Hill Creamery in Westminster, Jasper Hill Farm in Greensboro Bend, and Shelburne Farms in Shelburne. It was a lot of driving, but it seemed worth it for us to see several cheese makers of various sizes, all using very different systems to produce and market their cheeses. 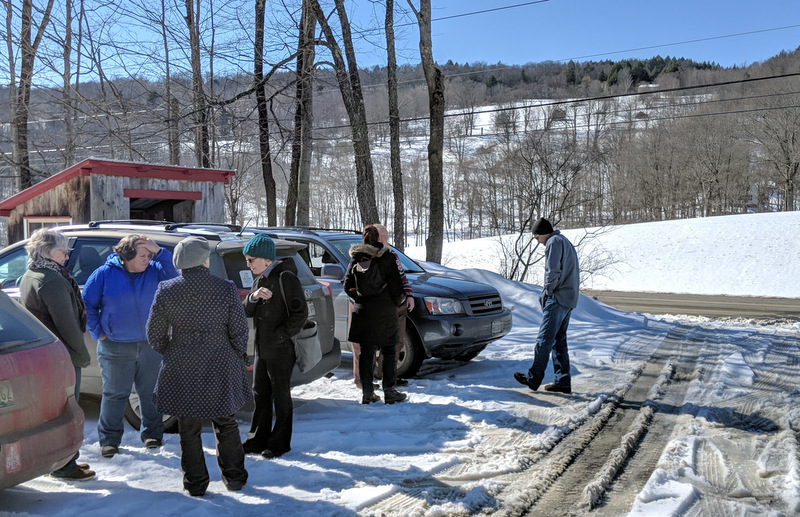 We kicked off the tour by gathering on a beautiful sunny Monday in Westminster West, VT just a few miles up the the Connecticut River from Brattleboro, and not far from Satans Kingdom, MA. Per my instructions we all got there early, gathering at the base of the driveway up to the Parrish Hill Creamery after the long drive from Maine. Eventually Peter Dixon and Rachel Fritz-Schall pulled up to show us around their production facility. 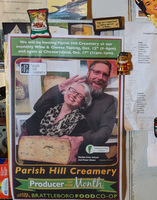 Their current make room is housed in a small building separate from a house on the property, and it was the original cheese plant used by David and Cindy Major to make cheese for Vermont Shepherd (which is now next door to them) way back when. 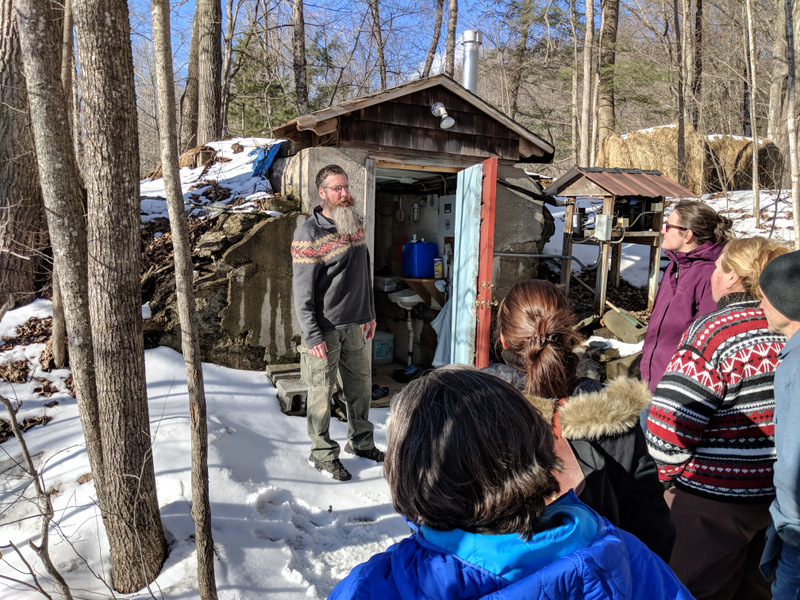 It is small and tidy, though Peter and Rachel are planning to enlarge the building this spring, adding a porch and access for the public to buy their cheese and whey fed pork in the summers. Peter and Rachel talked about their production set-up and their cheeses, we saw the stainless steel trailer that they use to transport milk from the nearby Putney School dairy to use to make cheese. 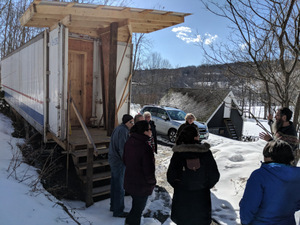 Then we walked up hill to see their innovative “Cave on Wheels” that they use to age some of their cheeses in a temperature and moisture controlled environment. After that we drove down the valley and around a hill to see their other cave, dug into the side of that hill, where they age their higher moisture cheeses: blue, washed rinds, and bloomies. Inside this smaller cave cheese wheels line both long walls top to bottom and in the middle of the space is a wooden table where they dry salt their young cheeses with Maine Sea Salt! Peter admits that it’s much more expensive than salt from food service suppliers, but it actually adds only a few cents cost to each of their cheeses, and it’s an important link to the region where he is making cheese. 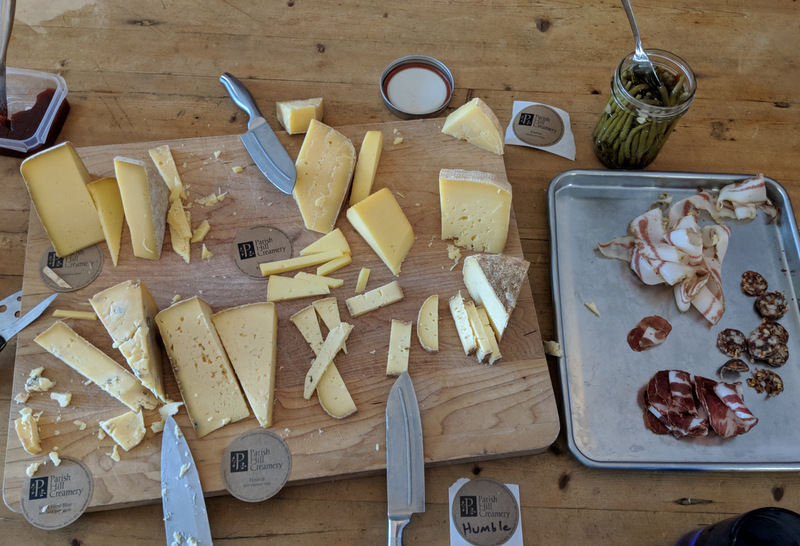 Finally they invited us up to their home to taste their cheeses, laying out a generous spread of many of their cheese types, plus examples of cured pork (guanciale, ham, and dried sausage) that they make for themselves. It was quite a feast, and we also were able to discuss the challenges of marketing premium handmade cheeses to local and national buyers. Peter manages to ship his cheeses affordably to markets on the East and West coasts, but as a premium product that’s not enough because it cannot compete solely by price. Every year Peter and Rachel visit cheese mongers and chefs in the cities where his cheese is distributed, and he tells the story of his cheese, their milk, the hills surrounding his cheese room, and why it’s different. He finds that he needs to constantly tell this story to new buyers, as well as remind his existing customers, so that they can pass it along to the consumers to understand why it costs what it does. We didn’t want to leave but still had a 2.5 hour drive ahead of us — we’d be staying in Burlington overnight so that we could get to Jasper Hill Farm — another 1.5 hour drive farther north — by 10am the next morning. Peter has come to Maine often at the invitation of the Guild to teach workshops on just about everything related to making cheese. It was wonderful to finally get a chance to see him and Rachel on their beautiful Hill in southwestern Vermont. 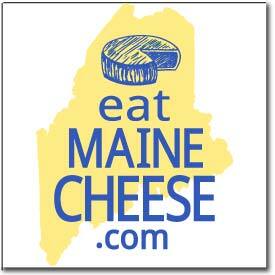 Posted in Events, Guild, Learning, News and tagged tours, Vermont.